Of all the incentives for installing solar panel systems, solar renewable energy certificates (SRECs) are some of the most complicated to understand. However, SRECs can provide sizable income to owners of solar power systems that live in areas with SREC markets. Solar Renewable Energy Certificates (SRECs) are a solar incentive that allows homeowners to sell certificates for energy to their utility. A homeowner earns one SREC for every 1000 kilowatt hours (kWhs) produced by their solar panel system. 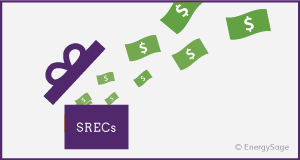 An SREC can be worth as over $300 in certain states. Not every state has an active SREC market, and the value of SRECs varies from year to year and from state to state. Talk to your solar installer to learn more about the specifics of the SREC market in your state, or use the Database of State Incentives for Renewables & Efficiency (DSIRE®) to conduct your own research about the financial incentives available to you. How can I make money with SRECs? Some states with solar carve-outs have established an SREC market to facilitate the sale of SRECs. When applicable, solar panel system owners can sell their SRECs through the SREC market to utilities that need to buy SRECs in order to meet their solar carve-out requirements. A typical size for a solar panel system is five kilowatts (kW): this size system will produce about five to eight MWh of electricity per year, and one associated SREC for every MWh produced. SRECs can drastically improve the financial returns of installing solar panels. 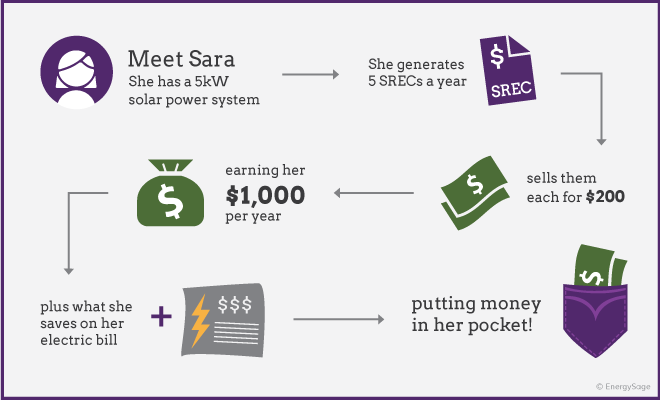 The amount of money a solar panel owner will receive for his or her SREC varies by state, and can range from under $50 to over $300 per SREC. This price depends on market factors of supply and demand, as well as a state’s alternative compliance payment (ACP). The ACP is a per-MWh fine that electricity providers must pay if they don’t meet their SREC requirements, and serves as a ceiling on SREC prices – electricity providers will save money by buying SRECs, but only if the SRECs cost less than the ACP. What happens to SRECs if I move? If you sell your solar home while there is an active SREC market in your state, you may be able to retain the rights to sell your system’s SRECs even after moving. That being said, it's most common to transfer the rights to the SRECs to the new homebuyer and new owner of the solar panel system. Many homeowners use this as a negotiating tactic when trying to sell their property for more money.